Go Back to the Homepage / McDonald’s India: Burgered! Really? McDonald’s India: Burgered! Can McDonald’s come out of the present crisis without its image getting deeply fried? 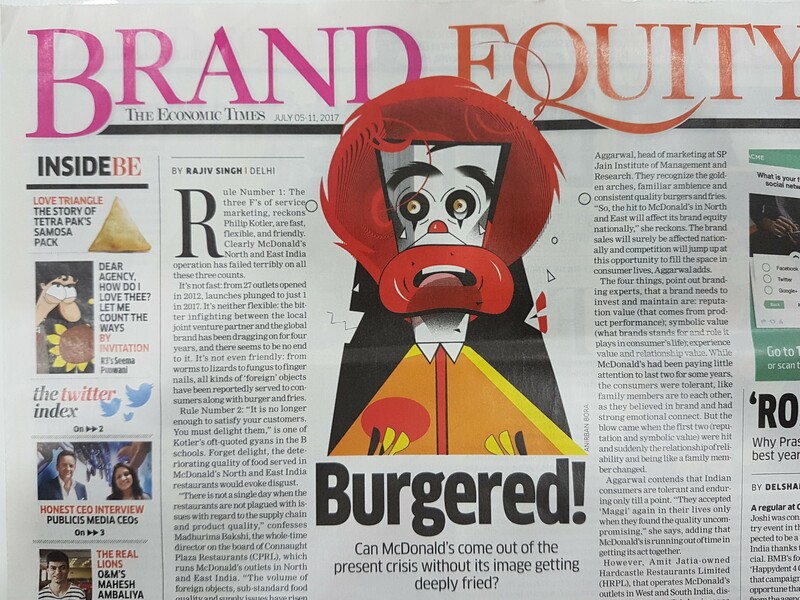 Above is today’s Brand Equity lead story on the recent ongoing crisis of McDonald India business. Rajiv Singh written Article seems to be an immature comment on the situation. Appears writer is completely misplaced with his thought process and has applied all the marketing logic wrong, though he has used Philip Kotlar’s quotes to justify his opinions. Hope it’s not a paid smear campaign to malign the McDonald’s India reputation? Non of the logic in the article are making sense or getting co-related to the sub heading of the article. Brand Owners in fight and Brand falling short with product promises with consumers are two separate topics/ issues and can’t be seen in the same light. Maggie fiasco is not old and is classic case of controversy around the brand and could have impacted brand’s relationship with consumers. But yet, within no time Maggie could bounce back due to brand trust and strong relationship they enjoy with consumers of India. Rule Number 1: Writer has completely missed on quoting three F’s of marketing. McDonald is known to be Fast, Flexible and Friendly to consumers and often they are quoted as example when it comes to living three F’s in day to day management of the business. It seems with his opinions writer is trying to cook a controversy out of nothing. Rule Number 2: Isolated incidents of quality are painted as bleak picture and negative impact on McDonald’s India brand reputation. This too again has nothing to do with the current ongoing infighting between owners of the brand. The way article is written, it seems Madhurima Bakshi, Director CPRL has been misquoted to the context. On the other hand CRPL has taken the serious note of the violation in supply chain, took corrective measures and suspended licensees of 43 franchise outlets. Customization is way of life in today’s world. “Different Stroke for different people” has been core of the McDonald’s India launch plan. That’s why putting aside their global product offerings, they designed completely new and different product range for India – “Aloo Tikki Burger” and Veggie Burger.” One won’t find these two products on McDonald’s menu elsewhere in the world but than India. These two products are McDonald’s India flagship SKUs and contributes maximum revenue. The writer has forgotten that there is no competition to McDonald’s burgers in this country. Any other burger if it is sold in this country, is sold on the back of McD burger’s brand reputation. Consumers orders other burgers thinking of McD burger. Also the fact is that there is no one (competition) equipped to take McDonald’s India place. Consumers hunt for McDonald’s outlet in this country and closure of few store won’t impact a dime to the reputation of the McDonald’s India. The moment storm is over and new stores starts popping up (or old stores revived), consumers will return to the store. Read the brand equity article here: Burgered!